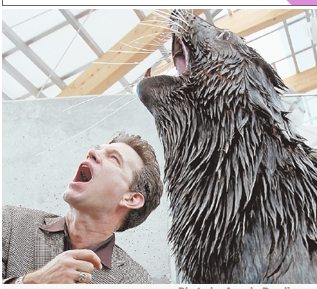 On Thursday, I had the opportunity of introducing our fur seal Isaac to the singer Chris Isaak. There are many things I like about Isaac and I always thought the story of how Isaac received his name was a cute one. Apparently, the night he was born, Chris Isaak was playing a concert nearby. Using this as their inspiration, the staff decided on a name for their new little fur seal. So it was fun to be the one to finally introduce the two. This is my favorite photo of the event! What do you think? Do you see a resemblance? Love the way they loved each other! Isaak and Isaac! Thanks from Stephanie in San Francisco.